Rachel Autumn Deering can straight write. This is my first time reading her work, but it’s safe to say I’m hooked. Being a Veteran, I connected with HUSK on a different level. HUSK is deeply unnerving and made me misty-eyed. I’m not crying, you’re crying. My eyes are just a little sweaty. 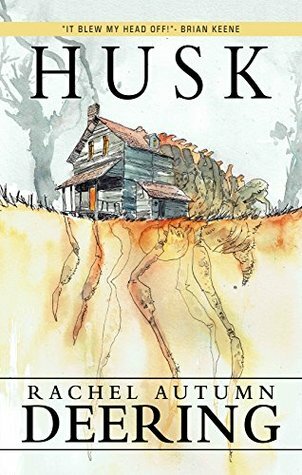 HUSK is very much a psychological horror story, but it also contains one of the creepiest monsters I’ve ever read about. As I type this, I’m constantly running my fingers through my hair. I have yet to see the creature out of the corner of my eye, so I think I’m good… for now. Kevin is a Veteran who falls in love with Samantha. Both of the characters are great. You can feel Kevin’s pain. You see what he is going through. Through Rachel Autumn Deering’s spellbinding prose, you get to see their relationship blossom. You also get to see what is plaguing Kevin. To me, the thing plaguing Kevin is a metaphor. I don’t know if the author intended for HUSK to be read like that, but that’s the way I read it. No one reads the same book, though. HUSK is a novella that reads quick. The writing is excellent. The characters are great. The dilemma is everything. How Kevin deals with the dilemma is utterly earth-shattering. I teared up a bit. The story is seamless. That ending dropkicks you in the chest and sends you reeling. It’s an experience I’ll never forget. If you’ve never read Rachel Autumn Deering, then I suggest you put her on your TBR pile. She is well worth a read. Everyone should give this one a go. Thanks so much for spending a little time with my story. I'm really glad you enjoyed it. Not sorry about the misty eyes. Not a bit.